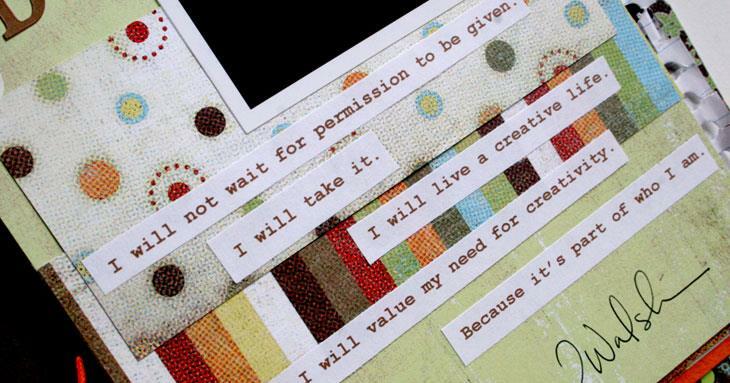 We are designed to be creative…so why is it that we feel so guilty for taking time to create? You have a to do list as long as your arm and a million other things you should be focusing on, but have you ever thought that if you stop and take time to be creative, you will end up being better at all the other things on that list? Fulfilling the creative need inside yourself will lead to a happier, healthier you… a you your family will love! This class will help you realize that creativity is an inherent need in each of us-a need that needs to be met, not overlooked, and you will find the courage to start down the path towards living a creative life today! Courtney is a freelance writer whose books include Scrapbooking Your Faith and The Busy Scrapper and she worked as a Contributing Editor for Memory Makers Magazine for 2 1/2 years. She's been published in Creating Keepsakes, Scrapbooks Etc., Scrapbook Trends and Simple Scrapbooks and managed the Chatterbox Design Team. Most recently, she has been working on her very first fiction series, which will feature scrapbooking in a fun and memorable way. The first two books will be published by Guideposts and will be released in the fall of 2011. 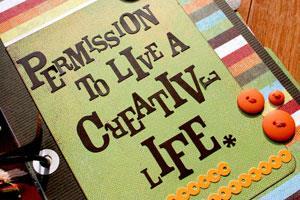 Permission to Live a Creative Life isn't a "once and done" kind of class. This class is just the beginning of a new journey in your life. You will learn tools to help you spark your creativity, ways to keep the creative fire lit, but most importantly, you will walk away feeling like it's not only OK for you to create, it's necessary. You will be able to carve out time for you—and to realize that the laundry can wait. What a freeing thought! After all, it'll be there tomorrow! The mini album you create during this class will serve as a place to keep your dreams safe, to stretch your creative wings, to try something new and different and most importantly, to never be judged. 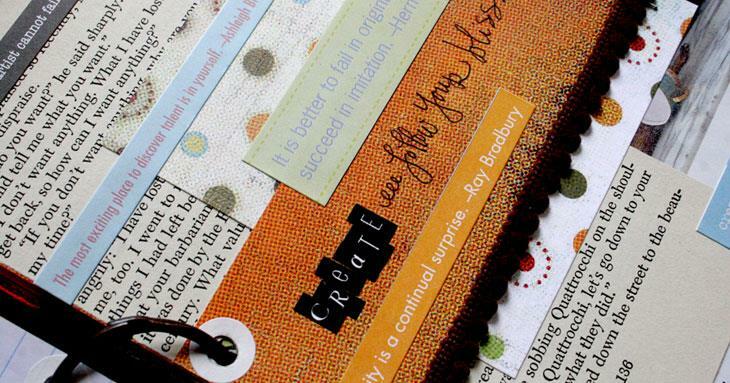 Courtney will walk you through all the steps you need to create a beautiful, unique album that you can easily add to once the class is over! Note from Courtney: I've spent many years practicing living a creative life. I've dabbled in it, dipped my toe in and finally learned that in order to be truly happy, I had to dive in head first. The most fun part of my life, though is being the wife of an incredibly creative children's pastor and mom to three-all of whom appreciate when I take creative time for myself…because a happy mommy makes everything better! I hope you'll join me in living a creative life! Sakura black fine tipped pen. note: I used Basic Grey Mellow, but it’s been discontinued. You can raid your stash for any coordinating papers. Best to keep the entire book coordinated—choose a color scheme or product line. It will keep the continuity better and make the finish product feel more cohesive. If you are looking for an alternative to Basic Grey’s Mellow, I suggest Basic Grey Archaic for earth tone lovers or Basic Grey Indian Summer. Both lines will give you the same feel as the sample mini album! one sheet Karen Russell Narratives Honeydew Collection scalloped paper. one-two sheets any other coordinating colored solid cardstock. five sheets of white/cream cardstock (for printing). letter stickers; American Crafts Remarks, Smokey Joe’s Cardstock Letter Stickers Neutral Set 2.
letter stickers; EK Success; Overton House Designs, Chocolate Collection, green stickers. letter stickers; Scenic Route Happy Valley Alphabet in Jade. Making Memories tiny alphas in black and white. letter stickers; American Crafts, Vinyl Thickers, Poolside in Cricket. additional buttons, 1 green, 1 brown. Small file folder; Rusty Pickle. Doodlebug Designs Paper Frills, Tangerine. miscellaneous ribbon in blue, green, brown, orange and cream. (three lengths, • approximately 6” each). reinforcement labels (office supply store). Please remember this supply list is just a loose suggestion. 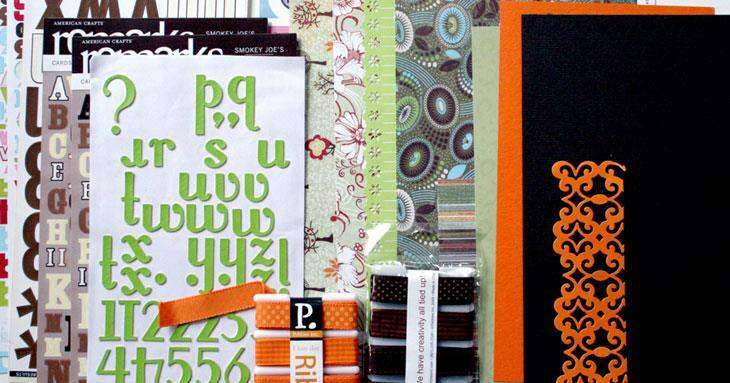 The key for this class is for you to pull together products YOU love—to use your stash—and to create something that signifies who you are as a designer. If you want to use red buttons, go right ahead! I promise I won’t be offended… in fact, I will be THRILLED!